Scavenger hunts appear to be popular right now. They are being used for local fundraisers. They are mentioned on many television programs this fall. Local college groups are joining in. So we went on a nature scavenger hunt of sorts. Our Septembers arrive with excitement for new teachers and school friends. There is also a bit of anxiety while we all adjust to the new changes—NEW teacher!, PE on Monday, new classmates, art on Friday before lunch, etc… We are searching for the new day-to-day routines. It’s an adventure as things quickly fall into place. Serving Western Massachusetts since 2005, Hilltown Families supports development and enhancement of our local economy and community. Local businesses, individuals, schools and non-profits are encouraged to partner with Hilltown Families through sponsorship and advertising. Let us help get the word out about your after school/homeschool class, event, camp, workshop, fundraiser, business/school, service, open house, volunteer opportunity or general announcement. 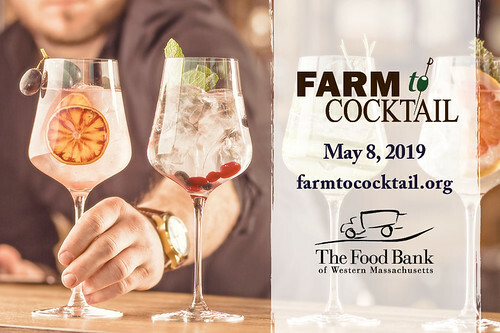 Deliver your message to thousands of families living throughout the four counties of Western MA while supporting the work of Hilltown Families. Click HERE to find out more. The Eric Carle Museum of Picture Book Art in Amherst is turning 10! Celebrate this Sunday, November 11th during their 10th Anniversary Book Signing Bash from 12-5pm. Come see the new exhibit, Iconic Images: Ten Years of Collecting for The Carle, with art from the masters of the past and present and favorite characters like Shrek and Babar on view! More than 15 artists will be there to sign books – and Eric Carle, Tony DiTerlizzi, and Peter Laird will be creating doodles! 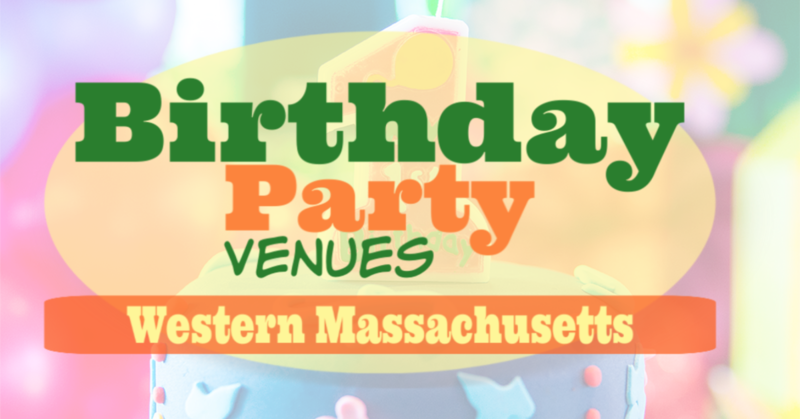 Plus, art activities, storytimes, live music, and free butterfly temporary tattoos! 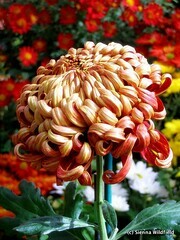 For schedule and information about doodles, please visit www.carlemuseum.org. Lions and Tigers and Museums, Oh My!, on view beginning November 17 at the Sterling and Francine Clark Art Institute’s Stone Hill Center in Williamstown, utilizes video, hands-on activities, taxidermy, and innovative displays to create an exciting learning environment for all ages. The exhibition includes a magnificent specimen of an adult African lion as well as a lioness’s pelt, claws, and a skull that will be available to encourage hands-on exploration. Visitors try on a gauntlet as they try to balance a wooden block that approximates the size and weight of a falcon for a first-hand experience of the difficulty and delicate balance needed in falconry. Visit clarkart.edu to learn about the exhibition and other family events and programs. On Sunday November 18th at 3pm, Jane Yolen, “The Hans Christian Andersen of America,” joins folksinger-songwriter Lui Collins in An Afternoon of Poetry and Song for all ages at the Ashfield Community Hall. This family-friendly concert features Jane’s poems interspersed with Lui’s songs, including several of Jane’s poems she has set to music. All proceeds benefit Upside-Up Music’s Scholarship Fund, making family music classes accessible in the Hilltowns. Refreshments, books and CDs available for sale and autographing at intermission. Suggested donation $12; students, seniors, low income $10; <12 $5; <2 free. Family maximum $29. Reservations requested: lui@luicollins.com. Cooley Dickinson Hospital has a lot to be proud of; voted the #1 Women’s Health and Childbirth Center again in the Advocate’s Readers poll for 2012. Want to share in the celebration? Learn more about the birthing options available at Cooley Dickinson Hospital, you will have tons of choices from OB/GYNs to certified midwives, to water births and more. Show your support for the Valley’s Best Birthing Center, “LIKE” Cooley Dickinson on Facebook and receive a FREE pair of socks for your baby. Facebook.com/cooleydickinson. For information about the Childbirth Center at Cooley Dickinson Hospital visit http://www.cooley-dickinson.org. And remember, “LIKE” Cooley Dickinson on Facebook for FREE baby socks. ADVERTISE YOUR FALL/HOLIDAY EVENT: Reach thousands of families in Western MA while supporting the community development work of Hilltown Families! 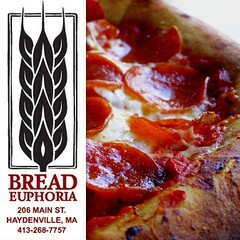 See your holiday event, open house, afterschool class, homeschool program, community celebration, workshop, school, or business featured here in the bulletin board section of our list of Weekly Suggested Events and eNewsletter, reaching thousands of families living throughout the four counties of Western MA! Find out more about our enhanced publicity packages and options and how we can help with your online marketing by emailing us at hilltownfamilies@gmail.com. Call for Youth Photographers: Western MA youth photographers ages 8-18 are invited to participate in an upcoming exhibit titled, “Places We Live, Play & Learn: Narratives of Life by Western Massachusetts Youth Photographers.” Hosted by Hilltown Families with the support of the Cummington Cultural Council, the exhibit will be on display at the Cummington Community House Gallery in the rear of the Cummington Community House, originally schedule for this fall, now scheduled for the month of January 2013. Exhibit gives youth an opportunity to explore their towns and document their findings both in images and a written narrative. 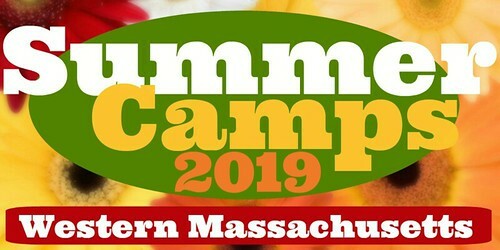 Participation is free and open to all youth living in Western MA. Deadline for entry has been extended to Dec 1st, 2012. An application and entry rules can be downloaded here: Places We Live, Play & Learn Application Form (pdf). In it’s third year, the Handmade for Kids Holiday Fair is the Cummington Family Center’s annual fundraiser and an excellent opportunity for community members to find commercial-free handmade items, many supporting creative free play. Saturday & Sunday, November 3rd & 4th from 8am-7pm in Franklin County. – CIDER DAYS: Franklin County celebrates its plentiful apple harvest and the delicious batches of cider that follow at the 18th annual Cider Days! The event includes fun events and activities county-wide – including an apple pancake breakfast, wagon rides and orchard explorations, cider pressing, lots of tastings (of ciders for big kids and little kids), and chances to learn about apple varieties, heirloom apples, organic orchards, and more! It’s a chance for families to develop a deeper appreciation and understanding of the apple industry – and to drink endless cider! Franklin County, MA. The Cushman Scott Children’s Center is holding their annual Mini-Mall Craft Fair on Saturday, November 3rd from 10am-2pm at 71 Henry Street, North Amherst. There will be craft vendors, a petting farm, pony rides, face painting, a bake sale and raffle. Handmade items by the Cushman Kids will be for sale too! 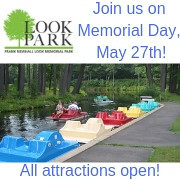 For more information call 413-549-1167 or visit online at www.cushmanscott.org. Cushman Scott Children’s Center is an independent, non-profit educational center serving children ages 15 months to 6 years old and their families. The center is raising funds for their new playground. Come check it out and support the school. Cushman is community! 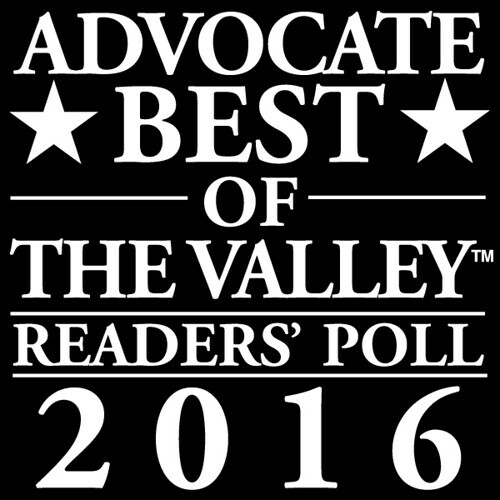 The Valley Advocate has spoken and moms throughout the Valley have placed their votes, and trust in Cooley Dickinson’s Childbirth Center…again! The Women’s Health and Childbirth Center at Cooley Dickinson Hospital was voted the #1 Birthing Center in the Advocate reader’s poll for 2012. Cooley Dickinson delivers tons of choices from OB/GYNs to certified nurse midwives, to water births and more! Show your support for the Valley’s Best Birthing Center, simply “LIKE” Cooley Dickinson on Facebook and receive a free pair of socks for your baby! Facebook.com/cooleydickinson. For information about the Childbirth Center at Cooley Dickinson Hospital visit www.cooley-dickinson.org. And remember, “LIKE” Cooley Dickinson on Facebook for FREE baby socks! 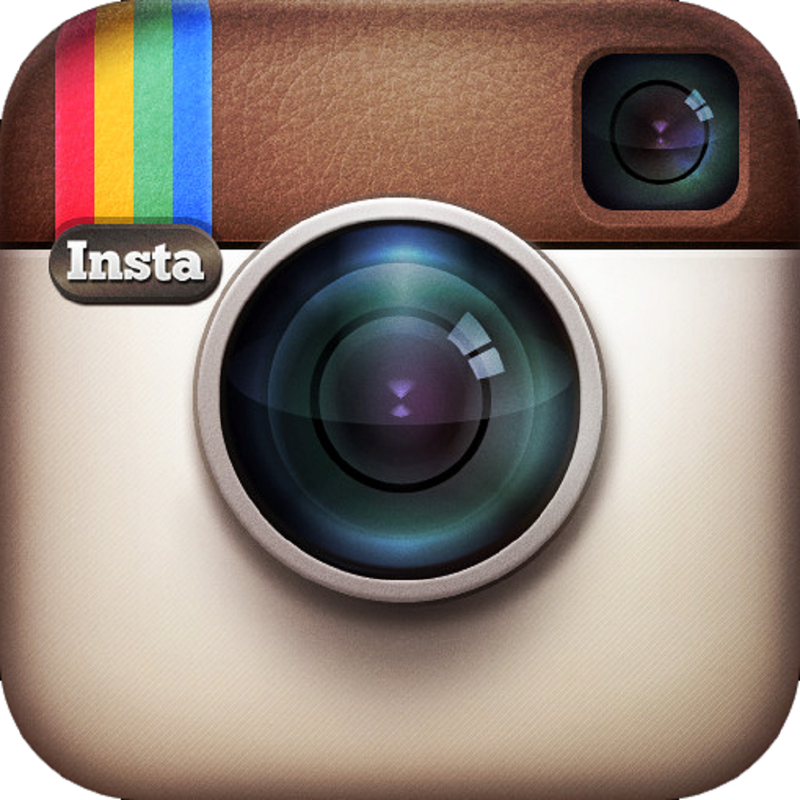 Hilltown Families is on Pinterest (pinterest.com/hilltwnfamilies) to provide Western MA families with information to browse in a comprehensible way. Some of our boards include Local Events, History, Community Based Education, Reading Lists, and Health & Wellness – among many others. 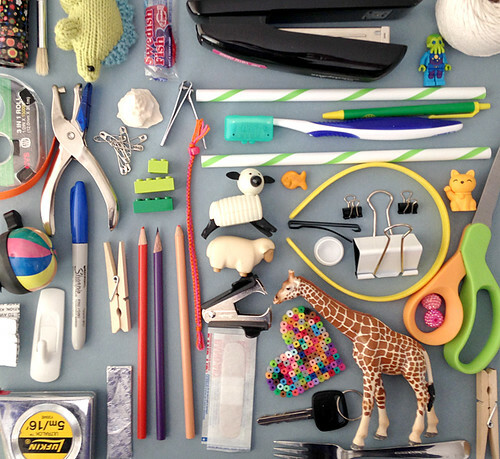 If you’re looking for a project to do with your kids, check out our Arts & Crafts board. If you’re trying to find ways to help out the local community, browse our Family Volunteering board. If you’re interested in discovering nature in Western MA, peruse our Ecology board. Never has a content sharing website been so easy to use and understand! 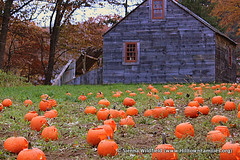 Western MA Premiere List of Halloween Events & Activities for Families! Enter for a chance to win a Handmade Doll House and Accessories at the 3rd Annual Handmade for Kids Holiday Fair happening on Saturday, Nov. 3rd from 10am-3pm at the Berkshire Trail Elementary School in Cummington, MA. – Co-sponsored by Hilltown Families. The Montessori School of Northampton’s annual Children’s Fall Fair and Open House will be held on Saturday, October 27 from 11am-3pm on the school’s campus at 51 Bates Street, Northampton. The full day of fun for families will include children’s games, arts and crafts, pony rides, a petting zoo, a bounce house, and more. Entertainment will be provided by percussionist Tony Vacca, and singer-songwriters Chris Scanlon and Burchie Green & Tom Knight. Food and beverages will be available for purchase. General admission is free; participation in some activities requires purchase of activity tickets at a minimal charge. Admissions information and tours of the school will also be available. 413-586-4538 or www.northamptonmontessori.org. Family Felting for all ages on Sunday, Oct 28 from 1-3pm at Crimson & Clover Farm (part of Northampton Community Farm) in Florence, MA. 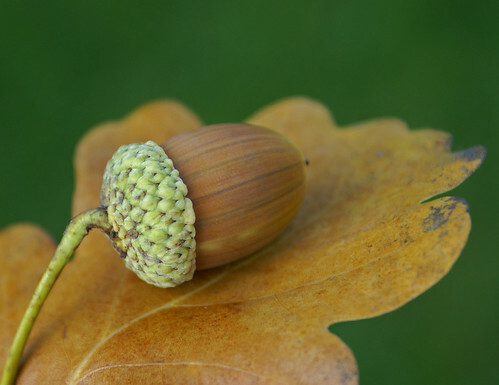 Come explore the world of fiber craft and learn about the animals that provide us with fiber. There will be an Angora rabbit and Shetland sheep for participants to meet, and learning stations for wet and needle felting. Create and take home a woolcraft. All levels welcome. $20-25/family (sliding scale). Spaces are limited! Financial Aid is available for all programs. Email farmeducationcollaborative@gmail.com for scholarship application. For more info & to register online, visit www.thefarmeducationcollaborative.org. Chandler’s Restaurant in South Deerfield is hosting their annual Witches Ball on Halloween Night, Wednesday, Oct. 31st! Come dressed in your Halloween costumes and enjoy a buffet including oozing zombie zits, lumberjack fingers, shredded mummy guts, vampire eyeballs and more. The fun doesn’t end with the food- Cloud 9 Productions will be at the Witches Ball for kid’s karaoke, there will be pumpkin decorating, and Teaching Creatures will be bringing some creepy crawly creatures to learn about, some of them you can even touch! Seatings for this event, are at 4pm and 5:30pm. Be sure to make your reservations soon by calling 413-665-1277. For more information visit chandlers.yankeecandle.com. Where is Myra and who shot Charley? Find out at The Williston Northampton School’s fall theater production of Neil Simon’s classic farce, Rumors. Opening night is Thursday, October 18th running October 18th-20th & 25th-27th. All performances begin at 7:30pm, with the Saturday, October 26th performance beginning at 8pm. The Williston Theatre is located at 18 Payson Avenue in Easthampton. Seats can be reserved in advance at www.williston.com/theaterproductions or by calling the Williston box office at 413-529-3434. Tickets are $7 students/seniors and $10 adults. Westfield Theatre Group presents The Odd Couple – Female Version on Oct. 12, 13, 19 & 20 at 8pm, & Oct. 20 at 2pm in Westfield for a fun parents’ night out. Recently divorced Olive Madison and friends play a friendly game of Trivial Pursuit. Then arrives Florence Unger, whose husband just left her. Thinking she is on the verge of suicide, she is barely able to go to the bathroom alone. Olive the slob and Florence the neat freak decide to live together with hilarious results. Directed by Theresa Allie. Produced by Linda Buzzee. Come see Linda Slozak, Nancy Colby, Winnie Legere, Kathy Leary, Kate Hebert, Larry Chiz, Paul Rothenberg & Sue Davis in Neil Simon’s hilarious contemporary classic. Tix: $10-$12. 413-572-6838. westfieldtheatregroup.com. Paint & Pixel Festival showcases Western New England’s amazing comic artists, book illustrators, and cartoonists! This year features 60+ artists, Teenage Mutant Ninja Turtle co-creator Peter Laird, Vertigo Comics Fables artist Shawn McManus, DC Comics Batman inker Jack Purcell, Conan the Barbarian and Goosebumps artist Greg Ruth, and underground cartoonist Gary Hallgren. Saturday, October 20, at the Northampton Center for the Arts, 10AM to 6PM. Paint & Pixel offers a free Children’s Comics Workshop every Thursday in October, 4-5PM at Modern Myths, and is looking for a few schools who would like a comic book artist to visit their students. 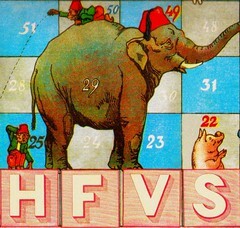 For details on the festival, comics workshop, and school outreach, visit www.paintandpixelfestival.com. In celebration of the 10th Anniversary of the Eric Carle Museum, the Academy of Music in Northampton is presenting Mermaid Theatre of Nova Scotia’s much anticipated new production of Eric Carle stories on October 26, 2012 at 6:30pm. Featuring evocative music, stunning visual effects, innovative puppetry, the triple bill shares Eric Carle’s most beloved stories: A Hungry Caterpillar, Brown Bear, Brown Bear, What Do You See?, and Papa, Please Get The Moon For Me. Immediately following the performance will be a question & answer period focused on how special effects were accomplished. Running time is sixty minutes. For ticket information please visit the AOM website, www.academyofmusictheatre.com, or phone the Box Office at 413-584-9032 x105. ADVERTISE YOUR FALL/HOLIDAY EVENT: Reach thousands of families in Western MA while supporting the community development work of Hilltown Families! 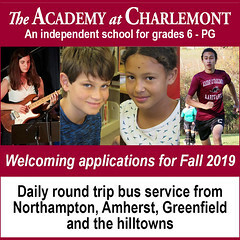 See your fall festival, holiday event, afterschool class, homeschool program, community celebration, workshop, school, or business featured here in the bulletin board section of our list of Weekly Suggested Events and eNewsletter, reaching thousands of families living throughout the four counties of Western MA! Find out more about our enhanced publicity packages and options and how we can help with your online marketing by emailing us at hilltownfamilies@gmail.com. The 10th Annual All- 4- Kids Fall/Winter Consignment Sale happens on Saturday, October 13th from 8am-4pm and Sunday, October 14th from 10am to 3pm (1/2 price sale). New extended shopping hours! This year the sale is in a NEW LOCATION at the former Fedor Auto Dealership at 228 Northampton Street in Easthampton, MA. Stop in and find new and gently-used clothing for infants through children’s size 20, baby gear, shoes and boots, Halloween costumes, snowsuits, toys, books, DVD’s, games, children’s furniture, and sports equipment. 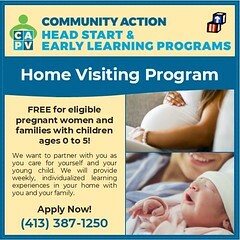 More info at www.sites.google.com/site/all4kidseasthampton. On Sunday, Oct 14 from 11:30am-4:30pm is the Grow Food Northampton FARM FEST 2012 at Crimson & Clover Farm (part of Northampton Community Farm)! Join The Farm Education Collaborative in celebrating the harvest at Farm Fest! Meet and learn about some of their farm animals and spend some time working with fibers, seeds, and more. Fun on the Farm in the Fall with Family! Meadow and Spring Streets in Florence, MA. 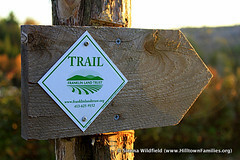 For more info visit www.thefarmeducationcollaborative.org. Stitch Lounge in Greenfield offers both youth & adult classes this fall, including: Alabama Chanin Skirt class using upcycled tee’s, stenciling & hand-stitching, Oct 18 & 25; and a beginners 3-part Wonky Squares Quilt class starting Oct 20. Never sewn before or have rusty skills? Check out their Beginner Sewing Class. Kids Classes begin in Nov.! Visit stitchlounge.net for more classes. Stop-in to find inspiration, modern fabrics, sewing notions & lots more, including social sewing! A devoted sewing space with all the supplies you need. Bring your own machine or use one of theirs. Stitch Lounge is located at 30 Mohawk Trail. Open Tues-Fri 10am-5pm, & Sat 10am-3pm. stitchlounge@comcast.net. 413-475-3246. HALLOWEEN COSTUME SWAP: You know that handmade costume you spent hours on a couple of years ago that your child has now outgrown, or the mask and cape you picked up at the dollar store that is “so last year” for your child this year? 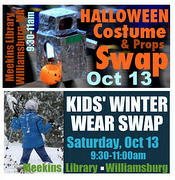 Bring it to the Hilltown Families Halloween Costume (& Props) Swap on Saturday, Oct 13th from 9:30-11am in the community room of the Meekins Library and swap with another child who would love to be that robot, purple monster or masked superhero this year… all while finding new inspirations for this year! Leftover costumes and props will be donated to Northampton ReUse. The Library is located at 2 Williams Street (Route 9) in Williamsburg, MA. Free & open to all. 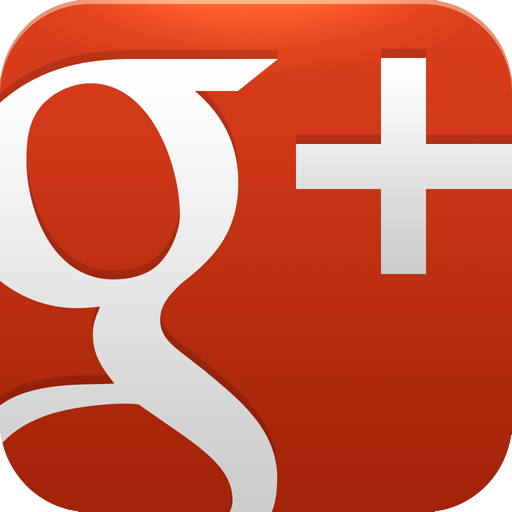 Join us on Facebook. KIDS’ WINTER WEAR SWAP: Do you have a bunch of winter weather gear that your kids have outgrown and wish that it would somehow just… get bigger? That may never happen, but you can get the next best thing… new-to-you gear that fits! Hilltown Families Kids’ Winter Wear Swap is happening again this year after a fun and successful swap last year on Saturday, Oct 13th from 9:30-11am in the community room of the Meekins Library! Bring winter jackets, boots, snow pants, hats, gloves & scarves that kids of all ages have outgrown to swap with other families. Leftover winter wear will be donated to charity. The Library is located at 2 Williams Street (Route 9) in Williamsburg, MA. Free & open to all. Join us on Facebook. Nestled among field and forest, The Montessori School of the Berkshires in Lenox Dale provides hands-on, individualized education for toddlers through eighth graders. Montessori education helps children become responsible, caring learners and community members who are self-motivated, confident, independent, and creative. 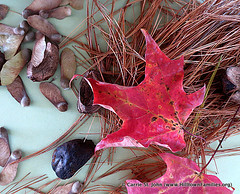 MSB’s LEED-registered campus allows children to learn about sustainability both within the classroom and out of doors. Children have access to the natural world through garden areas and trails. Dr. Maria Montessori considered this connection to the earth and living things to be an essential part of education. Join the school for an Open House! Oct 2, Oct 27, Nov 7. 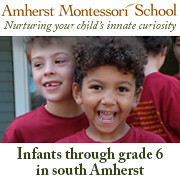 For more info and to register visit BerkshireMontessori.org. Halloween Costume Party with Mister G! Popular, international children’s music artist & local hero Mister G will be hosting a one-of-a-kind Halloween costume party at the Academy of Music Theatre in Northampton on Sun., Oct 28 at 11am. The event will double as a CD release concert for his Parents’ Choice Gold Award-winning album, Chocolalala. The bilingual (Spanish/English) CD blends Latin rhythms, traditional instruments and uniquely catchy songwriting. Mister G will also perform songs from his 2011 Grammy-nominated CD BUGS, called “irresistible” by People Magazine. Eat Pizza for Breakfast, wear your funkiest, scariest costume & come ready rock. !Bailamos! Tix: $8 children/$10 Adults. info@mistergsongs.com. www.mistergsongs.com. For October we have a pair of tickets to giveaway to see Leo Kottke at the Iron Horse Music Hall in Northampton, MA on Thurs, Oct 18th at 7pm. Deadline to enter to win: 10/15 @ 7pm (EST). BEST BETS: Fall Festivals this Weekend! The Sharing Tree Consignment Sale: Offering high-quality, gently used items for babies and kids, including clothes, shoes, toys, books, baby equipment, and maternity wear. Thousands of items expected. Public sale: Saturday, September 29, 11 a.m. – 4 p.m.; Half-Price Sale: Sunday, September 30, 9:30 a.m. – 12:30 p.m. at the Boys & Girls Club of Greater Westfield, 28 West Silver St., Westfield (behind Amelia Park Ice Arena). Now registering sellers and volunteers: sellers earn a percentage on the items they sell and shop early – before the sale opens to the public. Volunteers shop first – even before sellers! Find out more at www.sharingtreekids.com. For questions, email Karen at info@sharingtreekids.comor call 413-324-8733. Conway Festival of the Hills – Sunday, September 30. 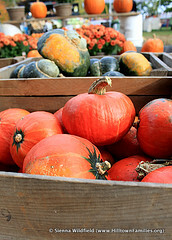 One of the best fall festivals around! Like their page on Facebook. The Festival has something for everyone – Covered Bridge Classic Road Race, kids activities (hill slide, hay maze, petting zoo, pony rides, and more), food (ice cream, baked goodies, fresh cider, and more), craft fair with many vendors, art exhibit and book sale, author signing with numerous local authors, live bands and music all day, Festival Parade at 1 p.m., Conway Historical Society open house, and the heralded Log Splitting and Skillet Toss competitions. 10am – 4pm. Free. Center of Conway, MA. Free introductory sign language class for parents and children 0-3 yrs on Thursday, Oct 4th at 11am at Cradle in downtown Northampton. 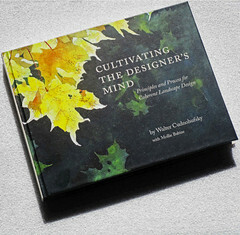 An 8-week class to follow on Thursdays at 11am beginning Oct 11th, also at Cradle. Cost: $100. Instructor: Kathryn Petruccelli. 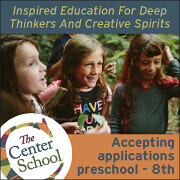 Classes include music, movement, & stories. Follows the Baby Signing Time series with additional activities apart from the Signing Time curriculum. Teaches real American Sign Language. Reduces frustration and tantrums; enhances cognitive development. A space to play and learn around this amazing communicative tool and watch our children speak to us with their hands – even before we get to hear their voices! Expectant parents, older siblings welcome. 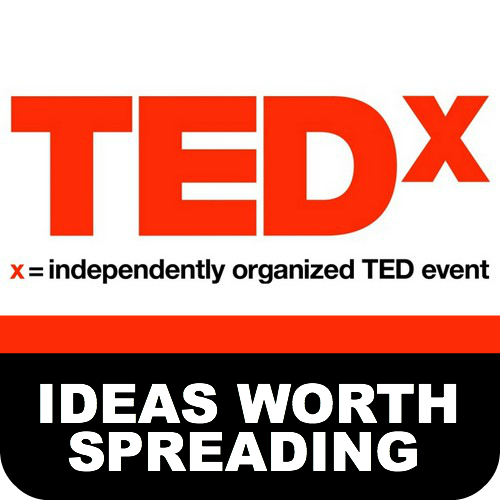 More info: www.startwithsign.com. The Eric Carle Museum of Picture Book Art in Amherst is offering a two-Saturday youth workshop in Oct in conjunction with their newest exhibit. “In The Art Studio: Inspired by Eric Carle” takes place on Oct 20 & 27 from 9:30-11:30am for youth ages 5-8. In this workshop children will study the new exhibition Beyond Books: The Independent Art of Eric Carle to take inspiration from his non-representational, 3D & collaborative art. Participants will paint colorful textures & patterns on a variety of surfaces such as paper, vinyl, & cardboard then sculpt them into window hangings, mobiles, name plates, & more. Advance registration required by Oct 15. Instructor: Meghan Burch. Cost: $50 (Members $40). Registration info at www.carlemuseum.org. ADVERTISE YOUR FALL FUNDRAISER: Reach thousands of families in Western MA while supporting the community development work of Hilltown Families! See your fundraiser, afterschool class, homeschool program, community event, workshop, school, or business featured here in the bulletin board section of our list of Weekly Suggested Events and eNewsletter, reaching thousands of families living throughout the four counties of Western MA! Find out more about our enhanced publicity packages and options and how we can help with your online marketing by emailing us at hilltownfamilies@gmail.com. 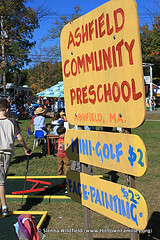 VOLUNTEER OPPORTUNITY: Ashfield Community Preschool is looking for some volunteer help with their booths during the Ashfield Fall Festival Columbus Day Weekend – October 6 and 7. This small non-profit preschool relies on the Fall Festival as the biggest fundraiser of the year. Volunteer jobs are appropriate for teens and up. 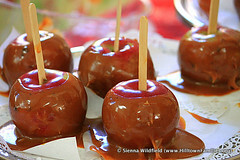 If you would like to help with simple face painting, running a mini-golf game (also very simple), or dipping apples in caramel while enjoying the beautiful scenery of Ashfield in early October please contact Jess Kuttner at jkuttner@gmail.com or 413-522-9732. 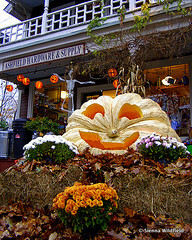 Historic Deerfield is a lovely place to visit any time of the year – but the fall is definitely a most special time. 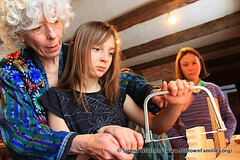 In addition to visiting historic homes and collections, visitors on weekends will enjoy involvement in hands-on activities on a variety of topics. 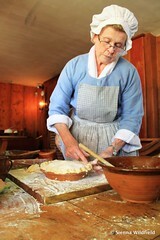 Open Hearth Cooking and Historic Trade demonstrations are featured on Saturdays, Sept-Nov, 2012. Highlights this fall for families include Stencil Art offered September and October weekends 12–4:30pm. Learn about the work of stencil artists who traveled from town to town taking commissions to decorate building interiors. Explore the art of stenciling and make a beautiful and unique stenciled artwork to take home. Also visit Into the Woods: Crafting Early American Furniture to see painted and stenciled furniture for inspiration! Participate in a Family Scarecrow-Making Workshop held on September 29 at 10am or 2pm. Once a familiar sight as a guardian of crops in the rural landscape, scarecrows are now more often seen as symbols of harvest time and Halloween. 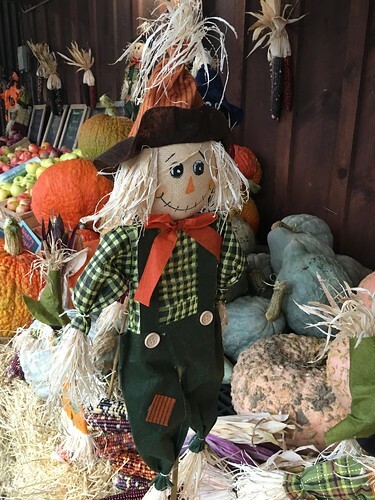 Try your hand at making a scarecrow, and learn about the fascinating history of scarecrows in New England, and around the world. Space is limited; pre- registration is required. Contact Faith Deering at 413-775-7116 or fdeering@historic-deerfield.org. Activity available with museum admission plus a $5 materials fee. Taking our cues from the seasonal changes around us, the museum will feature a program about apples on November weekends, 12-4:30pm. 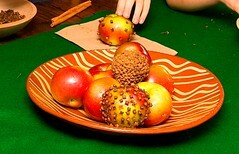 From Apples to Ornaments teaches about uses of apples and spices as you make an apple pomander to take home with you. From cider to pies to sauce, the bounty of fall apples has many uses. One way to use an apple is to preserve its fragrance and shape in the form of a pomander. Studded with cloves and fragranced with cinnamon, an apple pomander historically served as a festive and decorative air freshener. During the Thanksgiving holiday weekend learn about both Native and English histories. Friday, November 23 meet Narragansett descendant Jennifer Lee will talk about Native history and culture while demonstrating traditional bark-basket-making technology in a program called Native Traditions Past and Present. On Saturday November 24 we welcome Season of Thanks: Society of the 17th Century, a group of re-enactors who will bring our historic Hall Tavern building to life with an incredible array of period arts, crafts and trades. See redware pottery, spinning, lace making, herbal lore, quill pen writing, wood carving, basket making, and arms and armor. Capture the holiday spirit this December by joining our cooks, guides, educators, and craftspeople in a month-long series of traditional festive activities. Starting Saturday, December 1, visitors can see daily “Sugar & Spice” open hearth cooking demonstrations, participate in hands-on “Giftmaking” activities, and enjoy seasonal decorations hung throughout the historic Hall Tavern (except December 24-25). Experience the warmth of the hearth and take in the aroma of sweet, savory, and spiced foods prepared in the open hearth. Make one of three gifts by hand to take home and give to someone special. Weekends will offer additional activities including horse-drawn wagon rides, and a special “Silhouettes” event. Bundle up and tour the village aboard a wagon drawn by the beautiful horses of Karas Farm December 1–2, 8–9, and 15–16. Don’t miss artist Lauren Muney demonstrating the historic art of cutting likenesses from paper with just a pair of scissors on December 8–9. 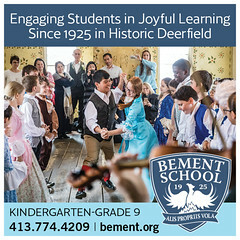 For more information about Historic Deerfield visit www.historic-deerfield.org for a full calendar of events and visitor information, or call 413-775-7214. Amanda is the Director of Museum Education at Historic Deerfield. She lives in Amherst with her family which includes an 11 year old daughter and 8 year old son.